The Umbrella Academy, The Rook, The Magicians - what fantastical worlds to watch? And last but not least, the upcoming Starz TV series based on the wonderful book by Daniel O'Malley, THE ROOK, with a new showrunning team, set to come out this year - it's a good year for action-packed fantasy series! Which one are you most excited about? Anything to add to the list? The Rook sounds a lot like the Bourne films, which completely grabbed me, so I can't wait to see a trailer. Second choice for me would be The Magicians. I love the sci fi but the trailer didn't completely grab me. It felt a little...acted. I tried watching The Magicians but I was completely bored by the whole mythical fairy tale land storyline. As for The Room, it sounds like a lot of books and TV shows: the aforementioned Bourne films, John Doe (one season TV show), The Blind Spot and countless urban fantasy books. I'll wait for the reviews. The Rook was a wonderful book! I'm so glad to meet a fellow fan! I've shared the book with several other people. Did you read the sequel? I didn’t even know there was one. I’ll read the Rook again and then the sequel! That's exactly what I did! Highly recommend so you remember all the characters. 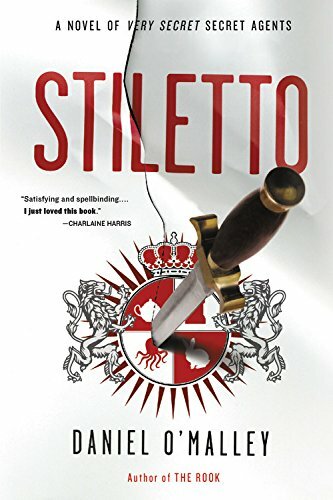 The sequel, STILETTO, is good - no sophomore slump here. Finally saw episode 1 of the Umbrella Academy last night - a promising start! And check out the giant umbrella to publicize the show in New York City's Bryant Park as seen over this past weekend.